Although hearing loss is often a gradual process that becomes more evident as we age, some people, like Christine Barkowsky, are born with profound hearing loss. 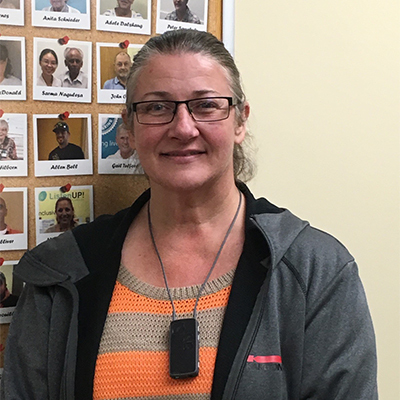 “The hardest part of having hearing loss is not being able to function independently without having to rely on others for communications,” says Christine who also finds it frustrating that there aren’t enough organizations dedicated to those who can’t afford hearing aids. Christine was nominated for the National Campaign for Better Hearing’s Give-back Program by her Hearing Instrument Practitioner Trena Morgan. The Campaign for Better Hearing encourages everyone over 60 years of age to get their hearing tested. For every hearing test that is taken, the campaign sponsors donate $4.00 towards the purchase of aids for those who can’t afford them. Christine Barkowky is the program’s latest recipient. “I need hearing aids for everyday functionality so this is truly a blessing,” says Christine.